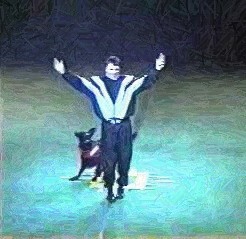 Simply the biggest family dog entertainment show production in America! 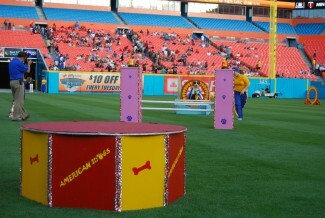 The American Idogs show “Bark to the Future” is a mega production kind of an dog idol family entertainment show that present a collection of games, jumps, acts, agility races, tricks, and demos by our National Performance Team. In this American Idol show ”dog version” some of these canine performance show acts involve kids from the audience. What sets American Idogs apart is that most of the team is made up of ordinary dogs doing extraordinary things. Our shows are full of energy, very inspirational and motivational for every future and actual dog owners. While some team members are professional dog trainers, most are just regular pet owners performing amazing feats with their canine companions (while having fun in the process). The canine stars of the show are the beloved family pets of American Idogs team members kind of the dog idol show. Some will make you laugh, cheers and sometime even cry. The show dogs are not always perfect, sometime really spontaneous and they love to improvise while in the spotlight. Some of their surprises are planned in advance, but others simply occur during the show and delight both audience members and show team members. We must mention that some of our pet idols are also trained to do the contrary of what the other members of the show are doing . But don’t tell anybody it’s a secret. Most of the other actual shows available on the market present a 15-30 min one man show with couple partners involving their personal dogs sometime up to 10 working in small ring space up to 2000 s.f. They can transport everything they need in a small Fifth Wheelers. The American Idogs National family dog entertainment show is a major 2 hours production composed of up to 25 different trainers and up to 40 dogs working in much bigger space (up to 20,000 s.f) ideal for arena ,stadium and even rodeo! However we can also adjust the show for shorter time like football half time show, basketball games with a smaller team based on your specific need. We also do event like: Fair, dog day, pet expo, corporate event, special event, kids event etc. This show require a passenger bus to transport our staff and trainers with their star dogs plus a 53 ft semi trailer just for our props, equipment, sound and light system. making it the biggest family dog entertainment production in America! Take a bit of the American Idol tour and America’s got talent, a slice of Dancing with the Stars, a drop of Disney on Ice, and a pinch of the Harlem Globetrotters. Stir it up with lots of love and enjoy! It’s like an American Idol and America’s got talent for dogs! These shows are suspenseful, dramatic, exciting, and funny. The upbeat music, special effects, and non-stop action will keep you laughing and cheering throughout the entire show. American Idogs is wholesome family fun for kids of all ages, from Puppies to Great-Grandpaws! Your Mummy will love it too! Meet the Stars after every show to get their “Pawtograph”. Every American Idogs exhibition showcases the humor and cleverness unique to “Man’s Best Friend”. Who Can Be an American Idog? You and your dog can be new stars!! The core team will soon travel to 12 cities across Florida plus Atlanta, GA to do 24 shows. Audition days will be held in each city to find new American Idogs extended teams members to perform with the team. 70% of the American Idogs are rescues. From Shih Tzu’s to Rottweiler’s, and numerous types of mixed breeds, American Idogs come in all shapes and sizes and all together to put on this spectacular show. But you musn’t forget K9-STEIN, our 2 legged mascot, who is an absolute kids’ favorite. American Idogs promotes responsible dog ownership and focuses on rescue dogs. Having so many dogs in the show who are rescues, the team wants the public to see how amazing each and every dog can be no matter where they came from. We feature an ongoing dog ownership education program for kids where they learn that dogs are not toys to be left unattended, and that owning a dog is a commitment for that pet’s lifetime. Along with the care and dedication it takes to own a dog, the kids also learn how dogs communicate with us. Kids learn the whole “Scoop on Poop!”. – Humane Society of Broward County with our free Poochies’ Playground and the ‘’Show me what your dog can do’’ contest that we have hosted for the last 5 years. -Markham Park Petpalooza 2007- 2008- 2009 where we were one of the main attractions for their 6000 visitors. – 2007-2008-2009-2011-2012 Barkpalooza in Plantation FL. 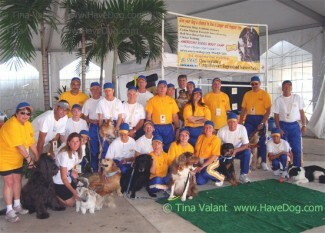 – 2009 Bark at The Park presentation at the Florida Marlin’s baseball game at SunLife Stadium fundraiser for the Humane Society of Broward County. – 2009 Riverwalk Mutts and Martini’s fundraising event for the Humane Society. – 2010 Dog Days Festival of Boca Raton, where American Idogs were the main attraction. – 2010 Bark at the Park Humane Society fundraiser at SunLife Stadium for 25,000 fans where American Idogs held a special presentation on the field 30 minutes before the Florida Marlins baseball game . – 2010 Bark at the Park at Sunlife Stadium for the Marlins’ game. – 2010 Paws Pet Expo in Fort Lauderdale. – 2011 at the Sawgrass Sanctuary City of Sunrise ‘Woofstock” Dog Day. – 2011 DogFest in Boca Raton at the JCC Center. – 2012 2 major audition days: First in Sunrise and the other one in Largo Florida. – 2012 Show at Ruby auditorium in Miami. – 2013 Show at the War Memorial Auditorium in Fort Lauderdale. – 2013 Cocoa Beach surf dog event. – 2015 War Memorial auditorium Fort Lauderdale. -2016 War memorial auditorium Fort Lauderdale. Let our fans know about your amazing company and products. We still have opening for companies to sponsor our canine entertainment show. For details click here. American Idogs is more than just a dog entertainment show. American Idogs is also an amazing dog training academy school located at Sunview Park serving the Fort Lauderdale (Ft-lauderdale) , Plantation, Davie, Hollywood, Tamarac and surrounding areas of Broward County in South Florida. Dog owners and furry friends are coming from across Florida to learn dog tricks, obedience, fun agility, games and canine musical freestyle using positive reinforcement training techniques. To learn more about our dog training school click on the Idogs Academy section on the top menu bar.